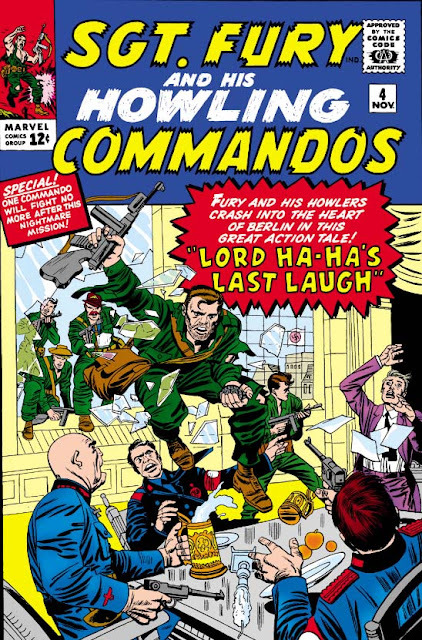 "Lord Ha-Ha's Last Laugh". Dumb title, right? Sounds like exactly the kind of hyperbolic, over-the-top villain name that Stan has been coming up from the beginning. Only one difference: This bad guy was based in true fact. From 1939 to 1945, an English-speaking radio broadcaster - derisively dubbed "Lord Haw-Haw" by the British press - spouted Nazi propaganda on the German airwaves, which was then transmitted to other shores until the last days of the war. And yet he peppered his broadcasts with nuggets of otherwise accurate information, one of the only sources providing reports on attacks and movements in Germany and behind enemy lines. As a result, Lord Haw-Haw was able to use this steady trickle of information as incentive for Allied forces to listen to these broadcasts, where the mocking tone and carefully laid disinformation could demoralize the troops and crush their spirits. In this fictionalized version, Lord Ha-Ha is the brother of Pamela Hawley, a Red Cross worker who Fury meets in London during a bombing. 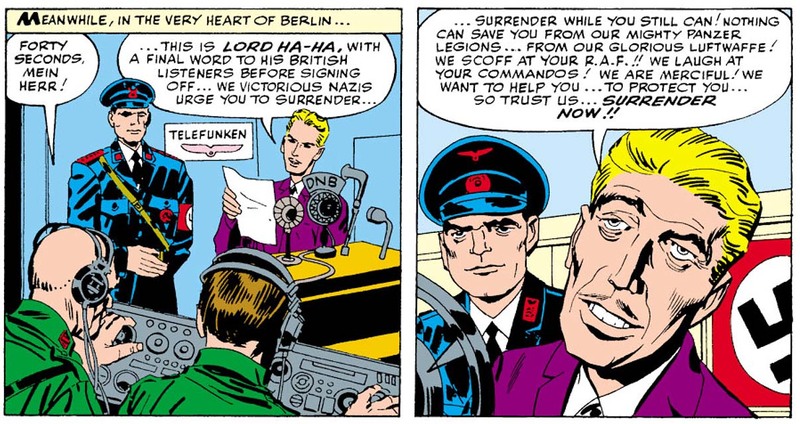 Her father, Lord Hawley, is convinced that his son is being forced to make these broadcasts against his will, and thus enlists the Howling Commandos to liberate him from the Nazis and thus win the Allied forces a significant propaganda victory. Sadly, by the tale's end it turns out that Haw-Haw is a traitor, does believe in the Third Reich ... and is yet mistakenly killed by his own side, the Nazis, while trying to escape the Howlers' custody. The demoralizing broadcasts may have been silenced, but Lord Hawley and Pamela have lost a brother and son - and to them it's a Pyrrhic victory indeed. Marking this as still a transitional issue, however, is the fact that even amidst the story's pathos there's yet room enough for Howling hilarity. On the outskirts of Berlin, the Commandos come across their contact, a female lion trainer, whom they meet while she's chasing her escaped lion. Yes, really. And her circus is to be their base of operations! Oddly, this ridiculous setting only lasts a few pages: just one of those bizarre occurrences the Howlers have to deal with in the pursuit of their goal. 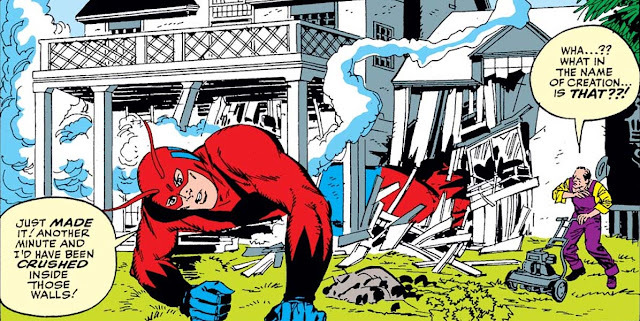 It would be a bold and risky move to introduce multiple changes to a comic in its second issue, just after the team has debuted. After all, conventional wisdom says that readers should have time to acclimate to a status quo before you start changing it - and let's not forget that frantic, frenzied changes doomed one title already. 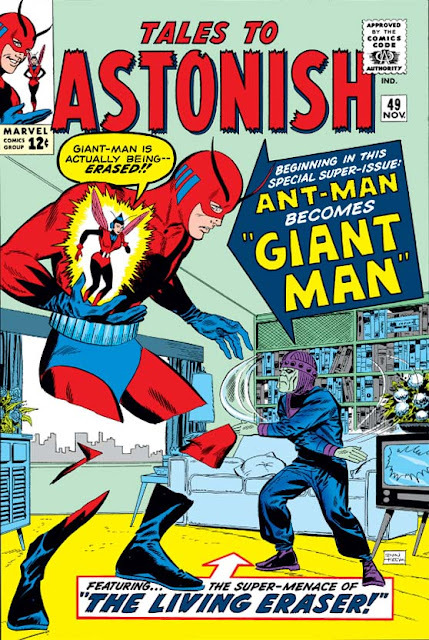 But Stan apparently has no use for conventional wisdom, because this issue highlights Hank Pym's new identity of Giant-Man! I suppose that's one of the necessary risks of doing a book which features characters with their own titles: major changes in those titles must then be acknowledged. All perfectly normal, if you're going to do that sort of thing. But what is unusual is to also debut the new feature of a character in this, the secondary book - such as when Jack Kirby shows us a cutaway of Giant Man's ant-communication circuitry, no longer encased in a bulky silver helmet as before, but wafer-thin and affixed to the inside of his mask. Watch out, Tony! The Hulk be spoilin' for a fight. Do the changes stop there? They certainly do not ... for at the end of this issue, the Hulk leaves the team! Think about that: One of the founding members has left, after their first official outing. It must have been positively shocking! Was this Stan's intent all along? Or did he really change his mind that quickly? 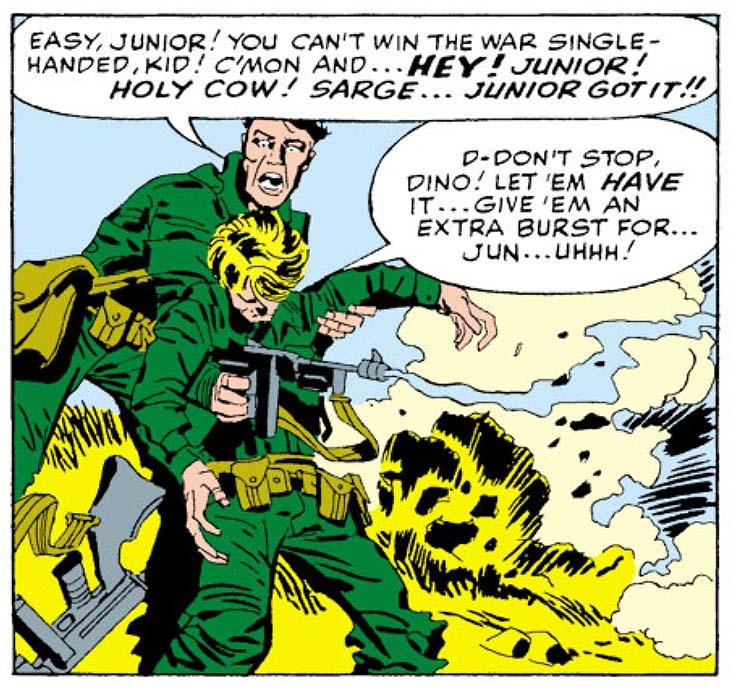 Did Stan suddenly realize that making the Hulk into a team player diluted the power of his metaphor as the ultimate loner? 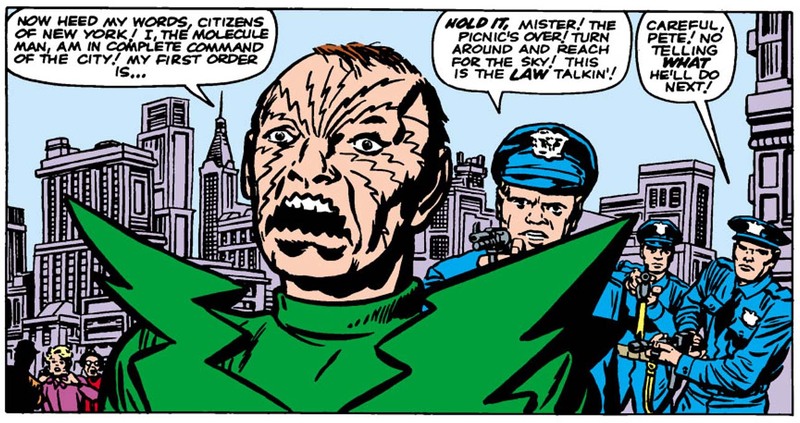 Or did the character, on second thought, seem too limited as a sullen, angry brute (unlike the Fantastic Four's cranky-but-more-evenly-tempered Thing)? 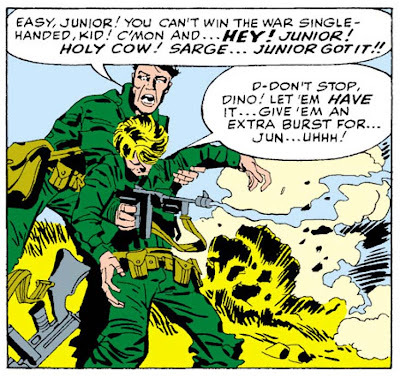 Or did Stan, perhaps, realize that there was even more untapped potential in the character than he'd first suspected, and perhaps he needed to rethink giving the Hulk his own feature again, sometime down the line...? The Hulk as portrayed in this issue seems more sullen and confused than anything else. Also, the angular design of the Space Phantom gives him a creepy and alien feel. Meanwhile, the villain for this piece is the Space Phantom. On the surface, he seems all too familiar, as he's yet another alien scout spearheading yet another alien invasion, in yet another allegory for American fears of the Communist threat. But it has to be said that in this case the analogy is more successful than usual, because the Space Phantom operates by stealing someone's identity and then infiltrating their life. In other words: Look around you! The invader could be anyone! perspectives that were unexpected, and often ridiculous. 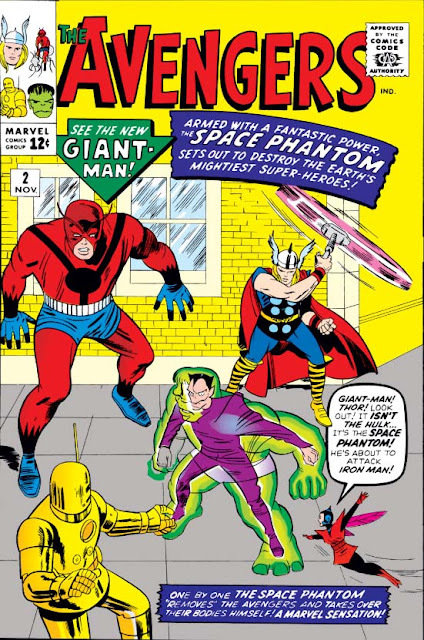 Additionally, this issue sees the Avengers get the headquarters they'll operate from for most of their existence, as Iron Man provides them with a mansion owned by Tony Stark. Pretty nice, that! (Though it's not yet called Avengers Mansion, and their famed and beloved butler won't show up for another year.) 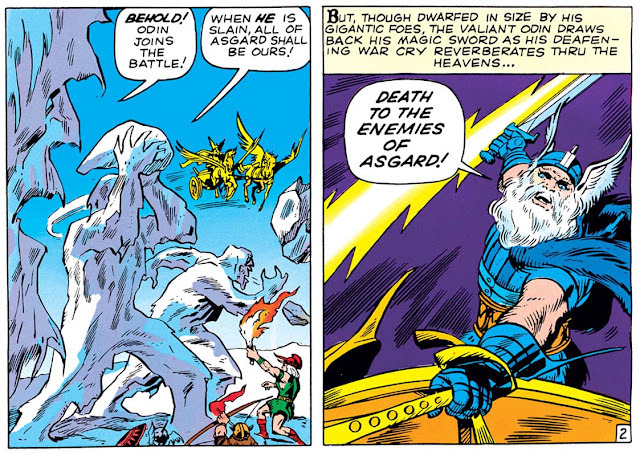 Also, take note of the "thou" in Thor's speech during this issue, marking what I believe to be the first appearance of his famed faux-Shakespearean dialogue - something that Stan could sometimes pull off, other writers often couldn't, and which yet remained rooted to the character until just a couple years ago. 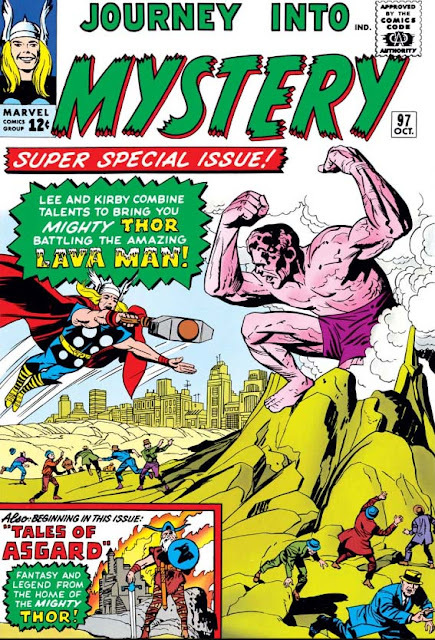 After returning to the comic last issue to help kick off Thor's new direction, Jack Kirby is mysteriously gone once again, and he'll remain so for the next three issues. (With the exception of the new "Tales of Asgard" backup stories, which he'll continue to pencil throughout.) There does seem to be a certain creative team shuffle in these strips for these next few months. 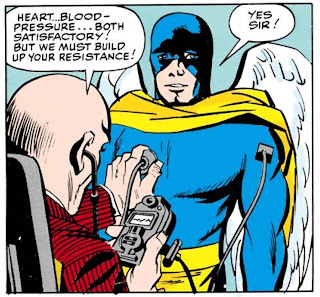 But that's okay, because as brilliant as Kirby may be, in the interim we get a guest stint by the inestimable Don Heck - an artist whose name I only vaguely knew before embarking on the Marvel Genesis project, but of whom I quickly became a fan. or else Don Blake kept a picture of himself as Thor upon his desk. 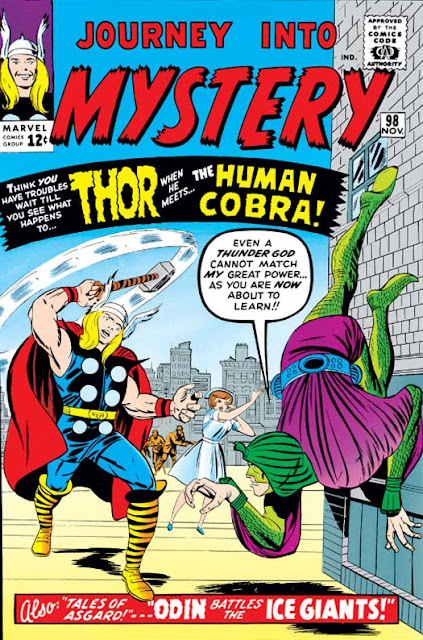 The evolution of the Marvel comic book progresses, as we get the first Thor story which explicitly continues on from the events of the previous issue. 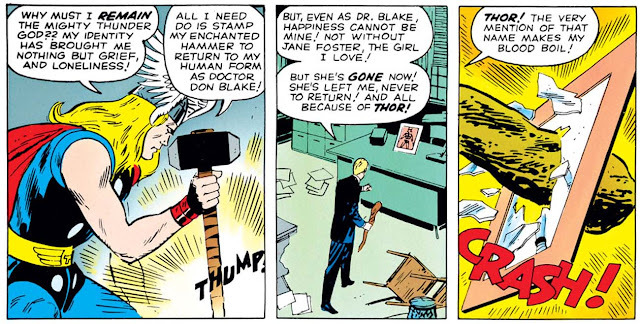 As you'll recall, Don Blake's constant disappearing act when needing to turn into Thor has resulted in his nurse Jane Foster getting fed up with his perceived cowardice and indecision - so she walked out of both his practice and his life. What's a lame doctor to do, when faced with such heart-rending disaster? Go on vacation, of course! Although the melodrama only lasts these two issues - Jane's back by the end, you see - it's still a sign that the interchangeable, inconsequential and non-changing yarns of the early days are on their way out the door. Surely one of the greatest lines ever written in a comic. So the villain this outing is the Human Cobra. 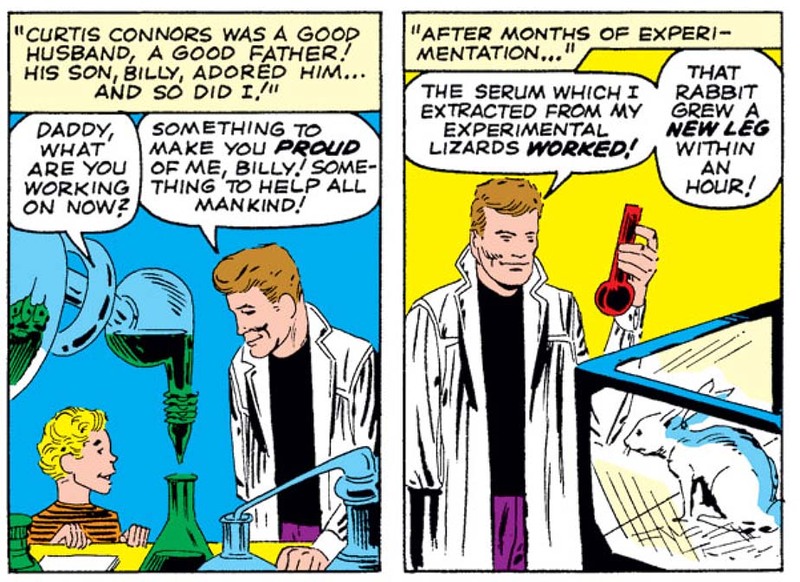 And OH MAN does he have one of the more convoluted origins ever seen! In India, the assistant to the noted Professor Shecktor is a shady ex-con named Klaus, who the prof has taken under his wing in an attempt at rehabilitation. Far from being grateful to such a kindness, Klaus envies the professor the fame and acclaim he receives for his work - so he concocts a scheme to do away with him. 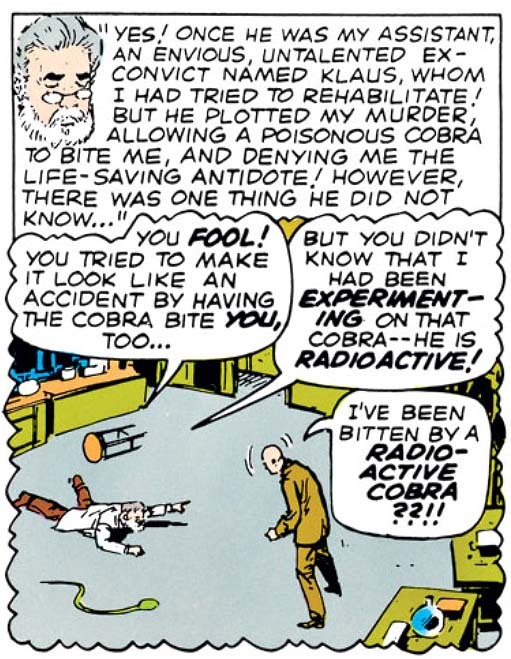 But ensuring the scientist is bitten by a deadly cobra isn't enough; no, in an attempt to throw any investigation off the trail, he decides he must also be bitten, while ensuring that he alone takes the antidote which he denies the prof. How was he to know that the cobra was radioactive...? Bit of a design flaw in the hammer's enchantments, wouldn't you say? 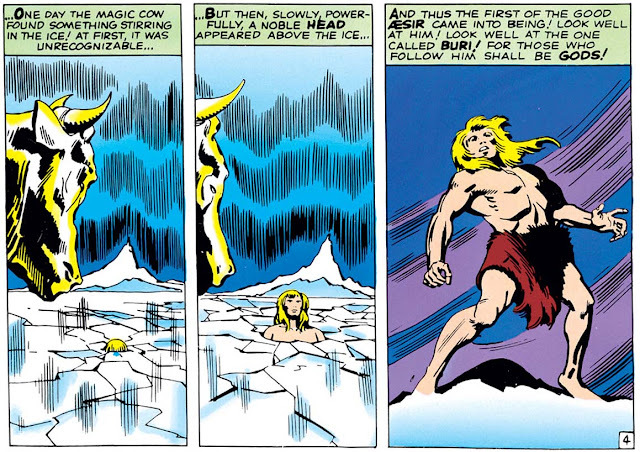 And Thor does his best Br'er Rabbit impression. 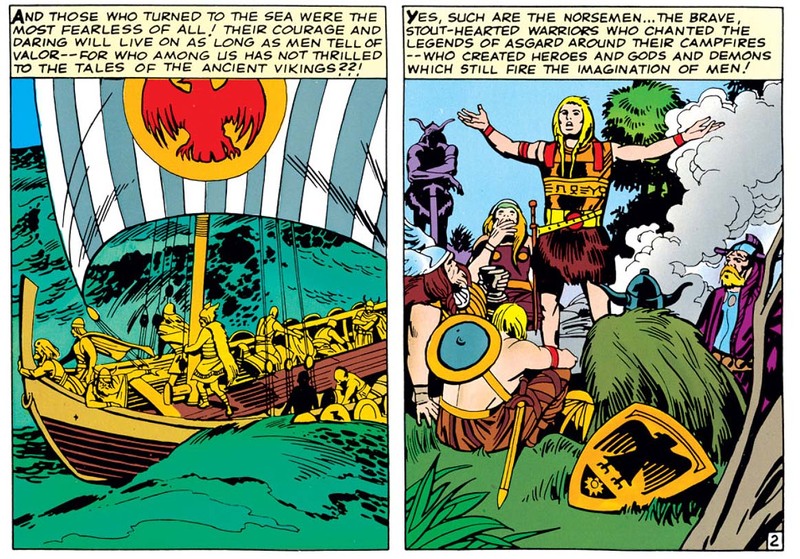 Continuing the new backup feature just begun last issue, we have the second instalment in "Tales of Asgard, Home of the Gods!" After last time's broad overview of the Norse myths, this time we have the first actual story, in which Lord Odin fights the Ice Giants and ... well, that's it, really. I mean, it is a welcome change to see Odin as King-hero for once, rather than just play the patriarchal supporting character role, but I can't deny a bit of disappointment with just how little happens: Ice Giants attack; Asgardians fight back; Odin traps their leader Ymir in a ring of fire. The End. 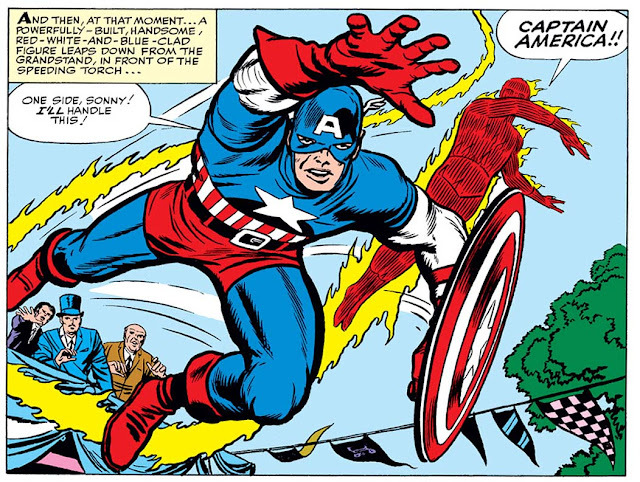 But then, I suppose one should keep in mind that we're still just in the introductory phase of these stories, and being only 5-page backups (told in giant-sized Jack Kirby panels, no less), the amount of plot that can be delivered at any one time is going to be limited. It may do to adjust one's expectations when reading these backup stories, recalling that the myths told in such broad strokes leave little room for details or plot, but rather place the emphasis squarely on the grandeur and epic scope. And in that, it must be said, the tales clearly deliver! These two panels take up the entire bottom half of the comic page. No small windows of action here! What a fantastically funky bit of perspective! They almost seem ready to fly out from the panel itself. It's interesting to see the ways in which the comic is finding its feet, as Stan & Jack still haven't realized what the book is about. 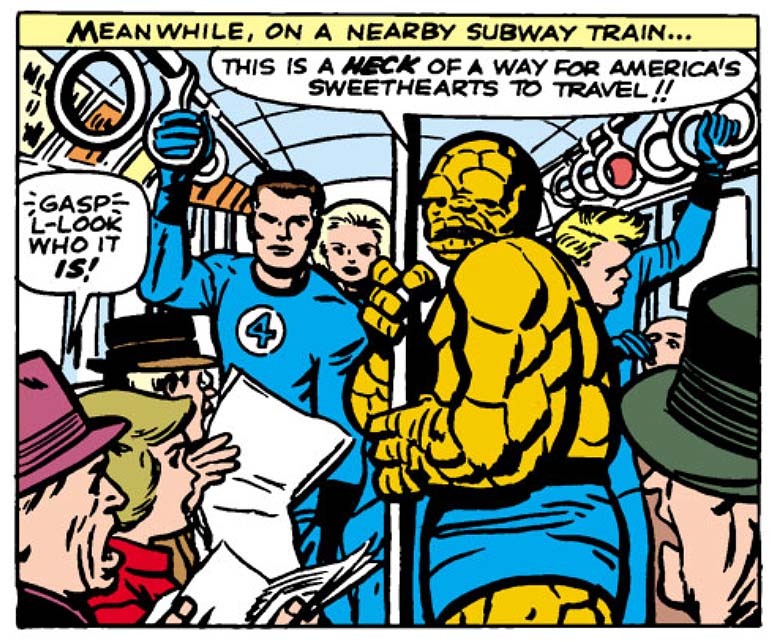 This is most starkly illustrated in the opening scenes, when Warren Worthington III, the Angel, finds himself mobbed by adoring and love-struck fans - as if the X-Men are celebrity superheroes just like the Fantastic Four! This disparity between The X-Men's beginnings and what the book would later become is further emphasized by Professor Xavier's relationship with Fred Duncan, an FBI agent in the Department of Special Affairs who has been tasked to working with the X-Men in order to more efficiently combat mutant threats. In other words, the X-Men are not simply unfeared by the public at this stage in their development - they're in fact positively depended upon. Heck, the government's even loaned them a special plane! to the Golden Age Angel from 1939's Marvel Comics #1. On the other hand, if we wanted to conjecture a history detailling when the Marvel populi began to distrust mutants as a whole, we could argue that this was when it all started to change. 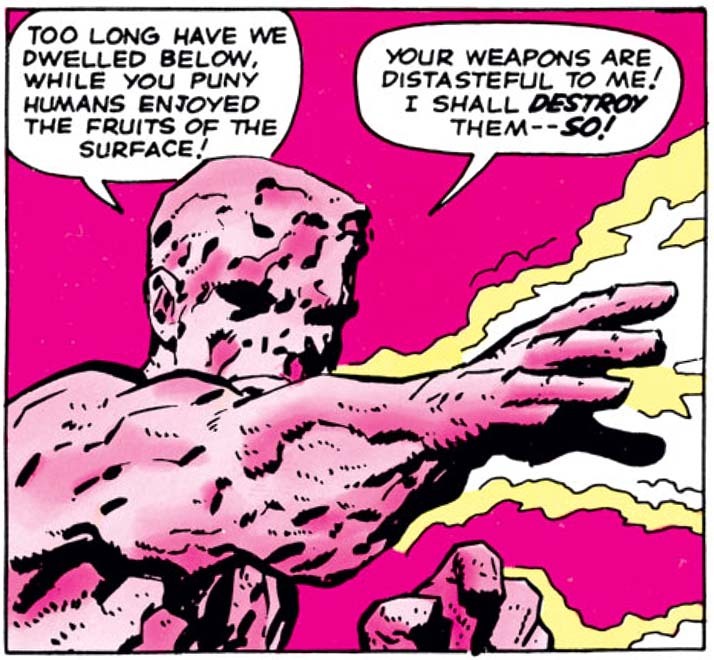 After Magneto's very public plans for racial elevation in issue #1, we here see the Vanisher referring to the men who try to stop him as simply "homo sapiens", the disdain dripping from his voice. 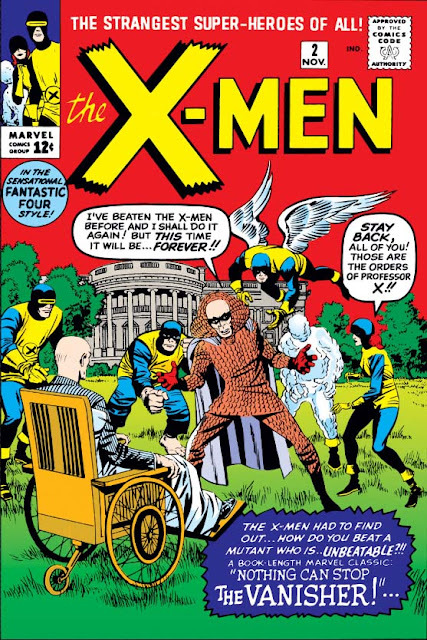 It could be argued that the public first thought of the X-Men as superheroes to be celebrated, just like the FF - but that the bad seeds of this new race, with their outright contempt for baseline humanity, soon turned the public perception against mutants as a whole. to make out the form of JFK agog at the window. 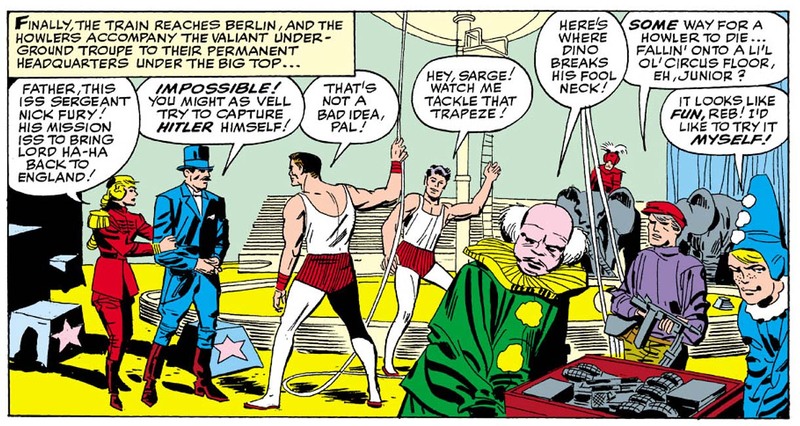 So, yes, the villain this outing is the Vanisher - and man, that is one weird looking dude. (Seriously: What's going on with his head?) His ability to disappear from one place and reappear in another is a surprisingly simple gimmick, and one that reminds us of the Living Eraser, or the aliens from the Fifth Dimension. In fact, his one bland trick does seem like that of a Tales of Suspense foe, or a Strange Tales baddie ... which makes you realize that although Stan has begun giving the separate heroes their own quirks and identities, he hasn't yet started to ask himself: "What make a good threat to the X-Men? What makes an Iron Man villain different from one for the Torch?" tried that stunt today, he'd be sued? With this issue, we have the final piece of Stan's plan. 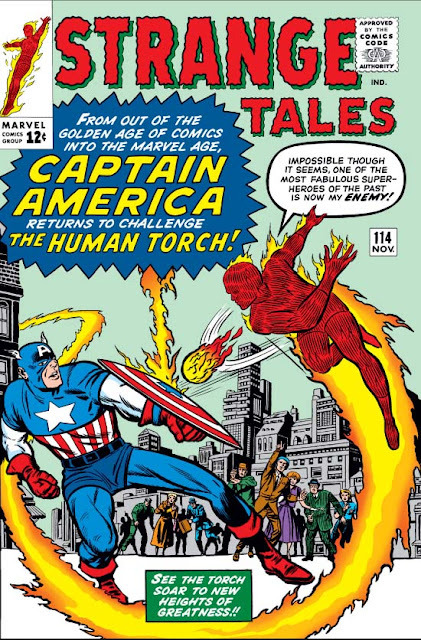 For these first two years, all of the superhero half-length features - Ant Man in Tales to Astonish, Thor in Journey into Mystery, the Human Torch in Strange Tales, and Iron Man in Tales of Suspense - all had Stan providing only the plot, with dialogue and captions added later by someone else. By taking over full writing duties on this issue, those days are now over. (I know I've hammered on it again and again as those changes have occurred, but it really is the beginning of a new stage.) 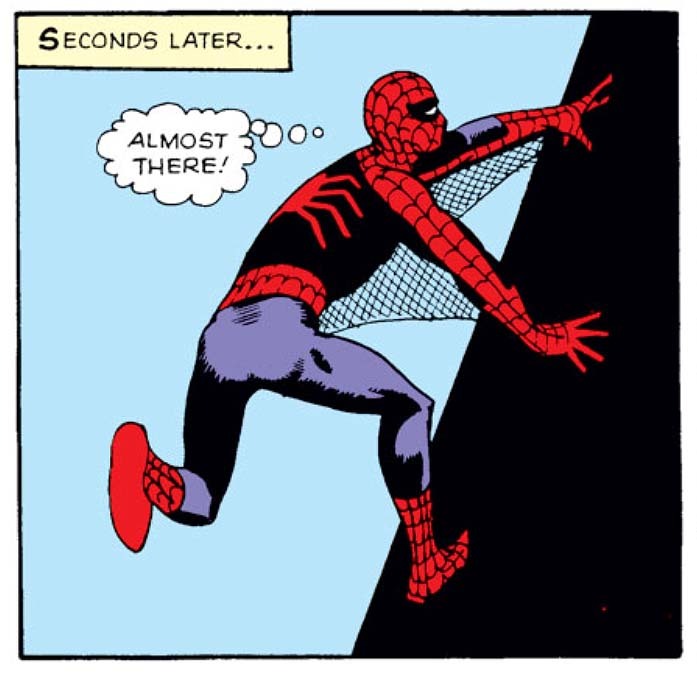 And, as he's done before, Stan further heralds his greater attention to these heroes by having one of his lead artists take over for a few issues - in this case, Steve Ditko! information is conveyed in a single panel, rather than in several. That said, the contents within don't show sweeping changes - and in fact, some of them are downright repetitive! In this story, Tony Stark finds his arms plant the victim of industrial sabotage. (Just like last issue.) When he therefore can't deliver on his contracts, this leads to congressional pressure. (Just like last issue.) 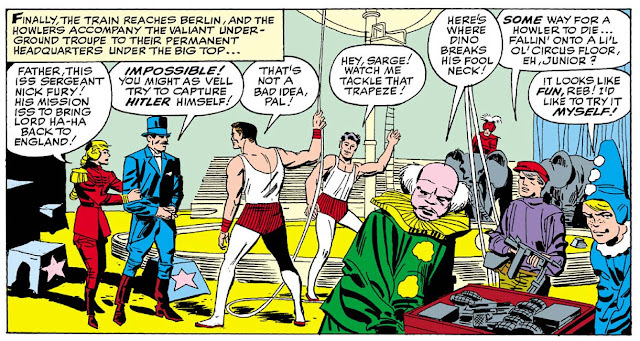 Fortunately, this unoriginality is made up for by the action - which starts immediately, before delivering a flashback and the villain's origin by page 3! So you at least can't say the plot wastes any time. What he possesses in inventiveness he more than lacks in fashion sense. Speaking of plot, the villain this time is one Bruno Horgan, The Melter. 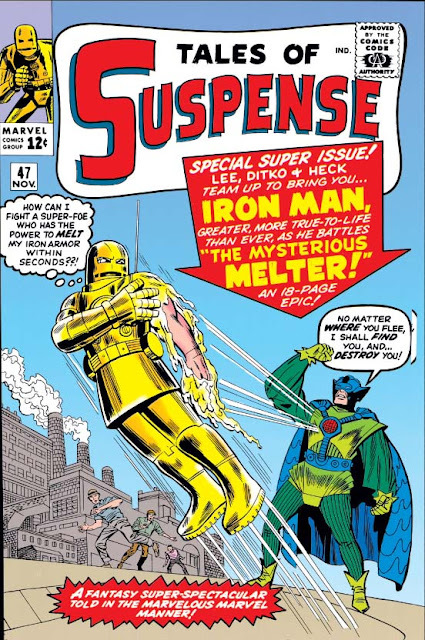 A former competitor of Tony Stark's, whose business failed when Stark pointed out his use of inferior materials, he subsequently discovered a directed beam by which he could dissolve iron in seconds. With his parallel background and inverse ability, he's seemingly Iron Man's direct foil - but then, so was the villainous Dr. Strange, and he was never seen again. 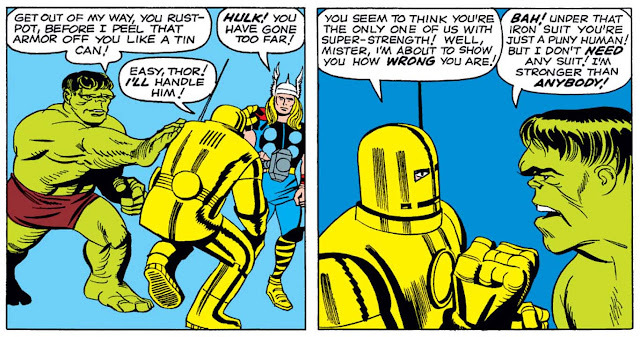 Amusingly, since the Melter's beam specifically melts iron, Tony tricks him by ... remaking his armor out of aluminum?! (Or "aluminium", as our international friends might have it.) It's a great, if ridiculous, twist, and one that foreshadows another major change, coming next issue. Tellingly, the Melter gets away at the end - and unlike Strange, will actually return. And not just on his own, either! I think I can see Ditko's work in the particular way Iron Man moves. in the way (for instance) that his Spidey work is based on grids of nine panels. In this issue we meet Curt Connors, the Lizard. And he's the first baddie who really commands our sympathies, as he's unquestionably a decent man gone wrong. A good-intentioned scientist as well as a loving husband and father, he lost an arm while serving as a war surgeon and instead became one of the world's authorities on reptile life. 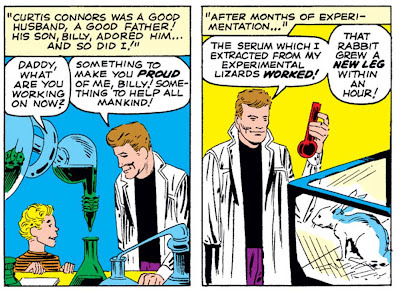 Fascinated with the regenerative ability displayed in certain lizards, and aware of the rewards all mankind could reap from such a development - his own phantom limb a constant reminder, of course - he painstakingly concocted a serum which he hoped might impart this capacity, and (because this is comics, after all) tested it out on himself. To his delight, his missing arm grew back in seconds - but, in a bald nod to Jekyll and Hyde, he in turn loses his humanity. a rabbit that was already missing its leg? Please? And what an action-packed issue this is! Which makes for a refreshing turn after the surprisingly lackluster Fantastic Four #20. 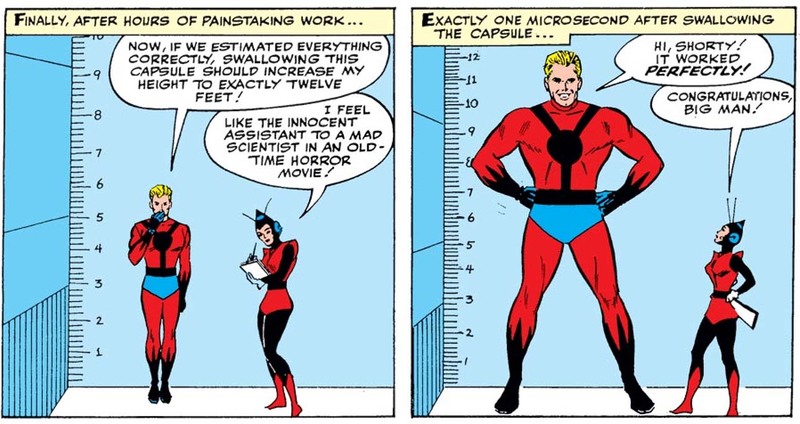 It's an intriguing contrast in what makes a successful comic book versus that which fails; they each have the same length, but this one makes SO much better use of the space it's given. 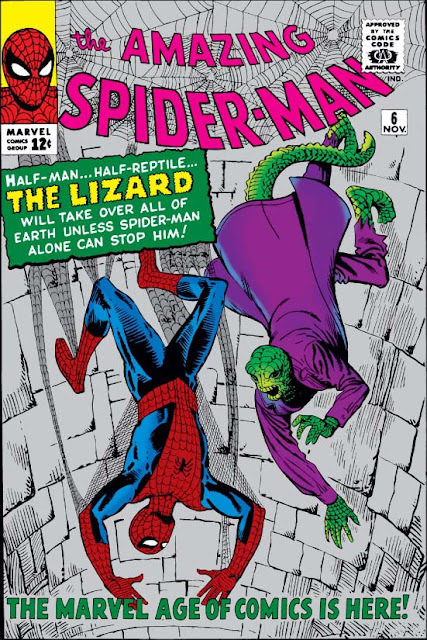 Whereas the bulk of FF #20 was just one big fight scene, this story sees quite a lot going on: After the initial setup of the threat, Peter foils a totally unrelated robbery at a museum before convincing Daily Bugle publisher J. Jonah Jameson to send him to Florida on the trail of the Lizard. Rather than a single fight scene, Spider-Man has three separate encounters with the creature, in between which he meets the Lizard's wife and son, and we're treated to a flashback scene of the monster's origin. 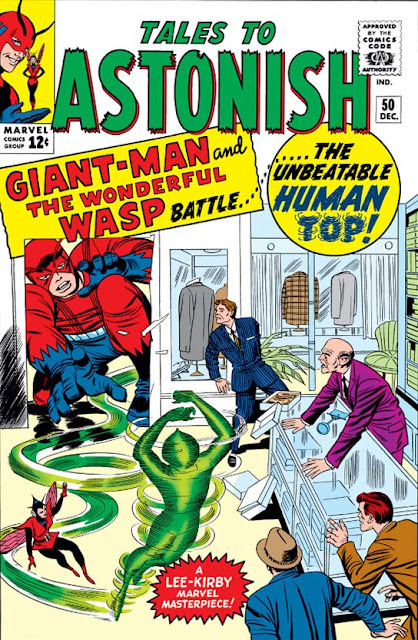 Add to all this the creature's defeat and denouement, some typically comedic faceoffs with Jameson, and Peter flirting with Betty Brant and Liz Allan - and you've got a comic with so many story elements the reader never runs the risk of getting bored! to his penmanship. You'd be crying too. But, having made this observation, I then naturally wondered as to the cause: Why (aside from varying levels of writerly inspiration) might one story seem so full, when another seemed so light? And so, wanting to get down to the bottom of the question, I pulled out the two stories - FF #20 and ASM #6 - and compiled some data on each. And the results were illuminating! 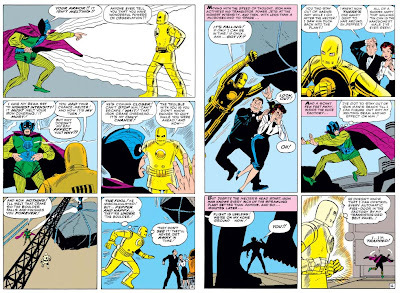 Steve Ditko is famous for his use of the nine-panel grid, where nearly every page consists of (or is based off of) nine equally-sized panels. By contrast, most pages in FF #20 contain five panels each - one tier of two panels, another tier of two panels, and one tier of one panel (in varying order). As a result, FF #20 has 105 panels total, or 4.77 panels per page ... while ASM #6 has 157 total panels, or 7.47 panels per page. 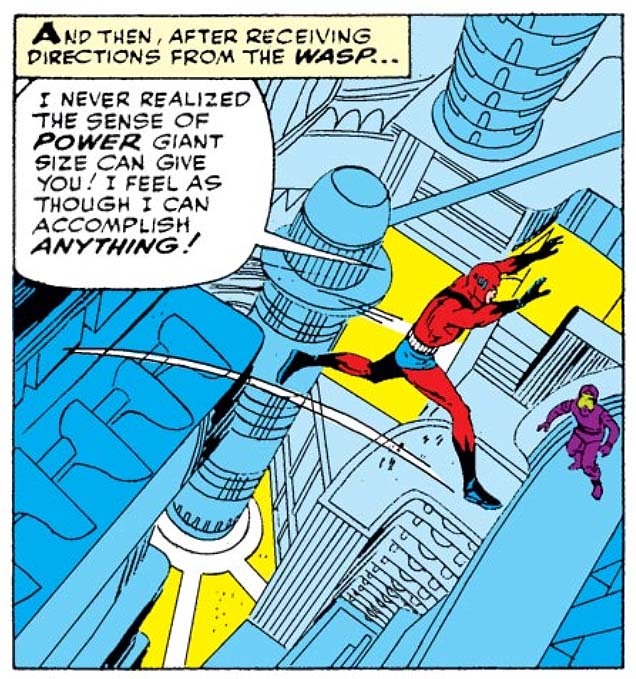 Artistically, it makes sense: Jack Kirby's drawing power, especially on The Fantastic Four, is his ability to convey grandeur and epic scope - see, again, his awe-inspiring scene of the FF landing on the mysterious blue area of the moon - while one of the main reasons Ditko was chosen for Spidey was because Peter is specifically a grounded and street-level character, in scenes that are less cosmic and with a more intimate feel. 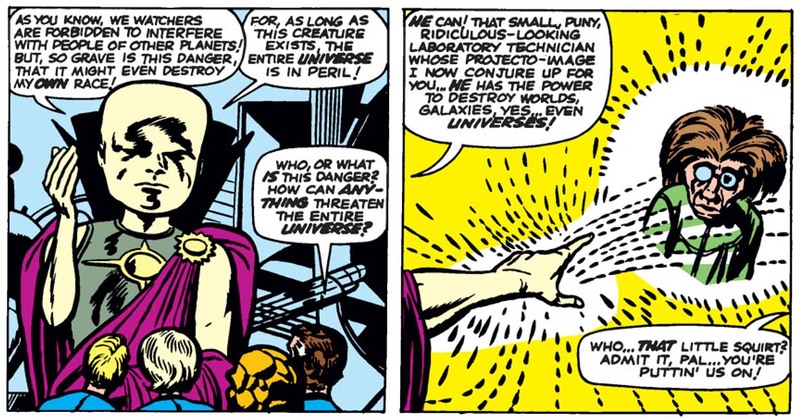 So Ditko generally has more space to work with, while Kirby has more leeway in conveying the incredible ... but it does mean that if Lee & Kirby don't deliver a wholly breathtaking tale, there are far fewer elements to distract us when the main story falls flat. That's a great one-panel transition. Finally, it's impressive to see the continued and steady evolution of Peter's character. 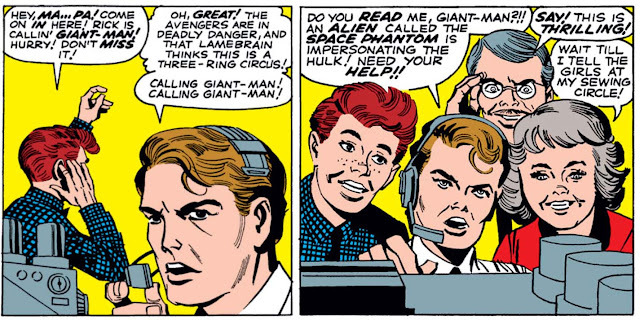 As mentioned above, early on in the story he's about to ask out Betty Brant when he's interrupted by another of Jameson's outbursts, and the story ends with Peter phoning up Liz Allan for a date instead. She turns him down - suddenly enamored with that hero Spider-Man who saved her at the museum - but instead of feeling rejected, Peter just shrugs in bemusement at his wry luck. It's a significant change to see him displaying this kind of cool confidence, something he clearly lacked in his earlier stories. (The cocky indifference showed in his first appearance doesn't count, arrogance being just one's insecurities overcompensating.) This might have been Stan's plan all along, or it could just be a natural change due to persistently wimpy characters making a dull read. However it may have happened, the continuing change is a welcome one, and it's refreshing to see a character we enjoy actually becoming a better, stronger person as we watch. 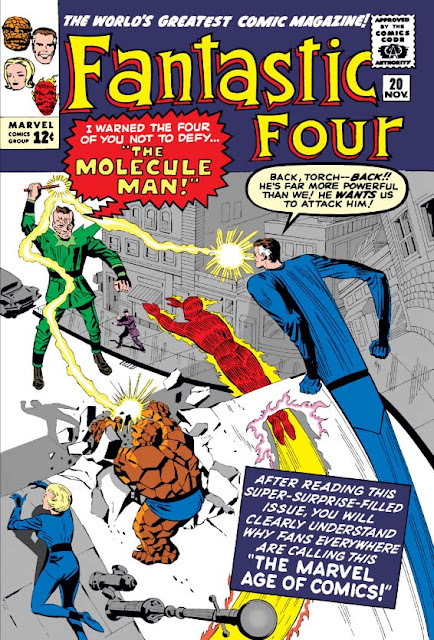 In this issue, we meet the villainy of the Molecule Man! And ... it's not a great success. No, he may not be as bad as any number of early Iron Man or Thor foes, never to be seen again - yet he would appear only sporadically over the decades, and usually command neither respect nor fear. 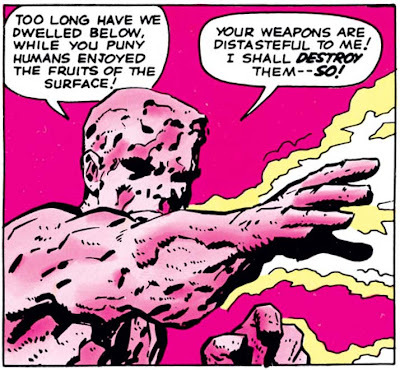 One has to wonder if it's due in part to the rather off-putting visual design - did Kirby actually create a look so creepy that the readers didn't clamor to see more? - but Stan sadly has to shoulder the blame for, it must be said, completely forgetting to give the character any engaging personality at all! In fact, only much later would he receive the surprisingly unique portrayal of a neurotic suffering from a massive inferiority complex, and it was this version of the character that would become most known for his roles in (the classic) Secret Wars and (the not so classic) Secret Wars II. of a multiverse, slipped in the careless words of a Watcher? In fact, if we're being completely honest here, the writing is a bit of a disappointment all round. 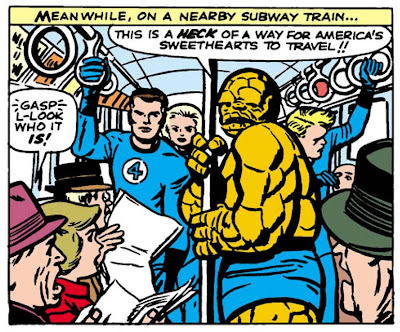 (In Stan's sudden desire to spend more time on the other heroes, has he mistakenly given the FF short shrift?) In addition to the rather bland villain, the plot's pretty lame too. After an opening scene in Reed's lab, Uatu the Watcher appears - in an inexplicably obscure fashion - to warn them about the Molecule Man. They then find and fight him, in a scene which lasts nearly half the book! It finally becomes a bit interesting, as they find themselves first on the run, then hiding out in Alicia's apartment ... but by that point there are precious few pages left, and nowhere left to go. Superhero fiction may ostensibly be a subset of the action genre, yes, but when the bulk of your story is one long, uninterrupted fight scene? There's not enough meat on them bones. Make no mistake: That's one creepy-looking dude. An additional oddity is the issue's confusing approach to the title's own history. As mentioned, the FF is first contacted by the Watcher, whom they first met on Earth's moon back in issue #13. And, y'know, bringing back that character wasn't strictly necessary. (The villain didn't need to be foreshadowed for just a couple of pages, and they didn't need a preexisting character to do it.) 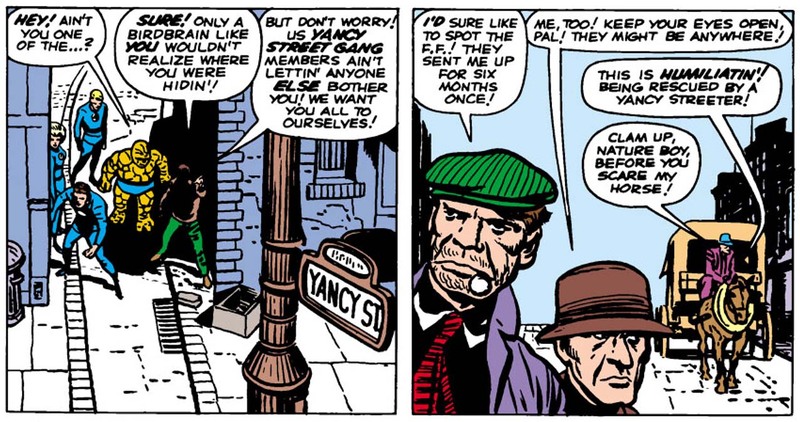 But Stan was already recognizing that the readers responded gladly to familiar elements - one of the reasons he began having the characters guest-star in each other's stories - and so aimed to make use of it here. And yet! 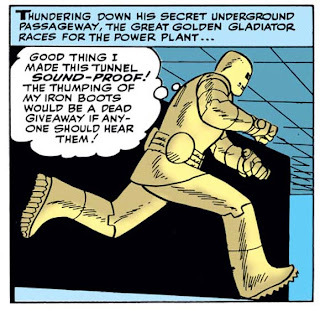 Not only does the story reuse the plot device of the Baxter Building being snatched from its foundations whole cloth - without any reference to the first time it happened in Fantastic Four #6 - but it also confuses us by having the story open with Reed discovering something shriveled and organic in a newly obtained meteor, which he says "proves that some form of life must exist in outer space!" Well, yes. 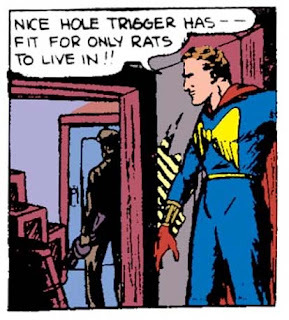 And you've encountered them - some half a dozen times in these first twenty issues alone! Ben's street-level irritants show their own particular brand of loyalty. The FF heading off, in search of a better story.